Thank you Missing Scootie. Adjusting is very difficult for me right now. My whole routine with my baby Boo is gone now. I have trouble concentrating on anything and am doing the best I can at work but I still can't talk to anyone there about my boy yet. I constantly think about his last hour and the what ifs set in. Those are the hardest times. Two weeks ago today was your last full day on this earth. I left for work and you stayed home. I thought you were fine. When I came home, you weren’t your usual self, wanting me to chase you through the house. You went to your food bowl and waited even when I held out your harness to go to the park. I should have known you weren’t feeling good. We still went to the park and you seemed to enjoy it. When we got home, it was the usual routine up until I turned out the light. When you started coughing during the night, I thought you had put your nose into the water bowl and were trying to catch your breath. In the morning, I knew something was terribly wrong. You were still coughing and would not get out of bed. Thursday, May 3, 2018 was the worst day of my life. I will never ever stop missing you, sweet boy. Ginger, I know your loss of Boo has been devastating. I wish it didn't take so long to heal and I wish the loss wasn't excruciatingly painful. You couldn't have known it was so near the end. We all hold onto hope for just as long as we can. My thoughts are with you today. Sending gentle hugs! I am so sorry for your loss. Believe me I know exactly how you feel. My dog Chompers was 8 and was fine one day and gone the next and I still don't know why. That's the hard part of it all. I still cant accept that hes gone in my heart, but in my head I know he is no longer here. Its a bitter pill to swallow especially when they are your life as I am sure Boo was. Hang in there and just take one day at a time. That's all we can really do. Dearest Ginger - I know exactly how you feel because I feel the same way after losing my Brutus and he has been gone over 9 weeks now. I feel empty inside, he was my constant companion, and I can't stand it. I use to see the world in color, now all I see is gray. I wish I could say something magical that would make you feel better but I cannot find the words. It is a horror roller coaster ride and there seems to be no end in sight. I have blind faith that one day, we will be able to manage, but I do not believe it will ever get better--but hopefully it will get bearable. It helps me if I can even slightly help others on this site if just to say I understand, I know what you are going through, you are not alone, and together we will get through this. I want to express my deepest sympathy for the loss of your beloved Boo. I like to think that Brutus and Boo and romping and playing together on the Bridge, waiting patiently for us to meet up with them someday. Then, all will be right with the world at last. Thank you, I hate to know that there are people like me here that are hurting so violently. I feel like I'm moving in slow motion. Yes, Boo and Brutus playing together makes me smile. Thank you for your kindness. I'm so sorry for your grief - I totally get it, because waking up alone these last few days has been agonizing. My baby girl used to detect the minute my eyes would open or I'd start stirring, and she'd climb on me meowing and making biscuits on my back until I got up to start my day. And now, I don't have that. May you find peace and comfort today, as may all of us who are missing our beloved fur babies. 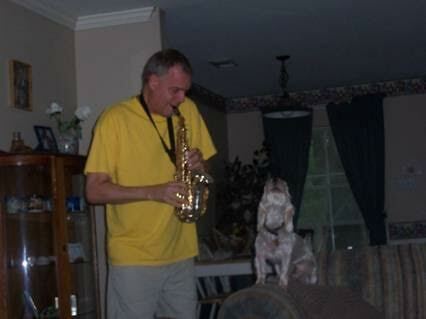 My Boo loved singing with the sax. He was such a hoot! What a fantastic picture of your "singing" Boo. Thank you for sharing it. I'm certain your Boo lived a life full of love thanks to you. I wish you and others here peace and comfort.